Nick Grief is a Professor in Kent Law School and Dean for the University of Kent's Medway campus. He teaches EU law and International law. His research interests include the legal status of nuclear weapons, air and space law and human rights. Nick has a BA in Law with a Language (French) and a PhD in International Law, both from Kent, and is a Senior Fellow of the Higher Education Academy. 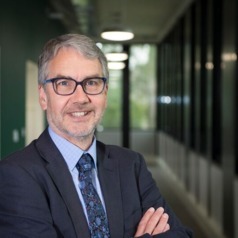 Before returning to Kent in 2010, he taught at Bournemouth University (1998-2009, including 8 years as Head of School) and the University of Exeter (1979-1997, including 2 years as Head of the Law Department). He has been a Visiting Professor at the University of Connecticut School of Law and is a member of the Center of Theological Inquiry, Princeton. In 2007 Nick gave evidence to the House of Commons Defence Committee on the legal implications of the White Paper on ‘The future of the United Kingdom’s strategic nuclear deterrent’. In the 1990s he was closely involved in the World Court Project (notably as the author of a legal memorandum entitled ‘The World Court Project on Nuclear Weapons and International Law’) which led to the International Court of Justice's Advisory Opinion on the Legality of the Threat or Use of Nuclear Weapons in July 1996. Nick practises as a barrister from Doughty Street Chambers, London. From April 2014 to October 2016 he was a member of the legal team which represented the Marshall Islands before the International Court of Justice in nuclear disarmament cases against India, Pakistan and the UK. The team was nominated for the Nobel Peace Prize for its work on the cases.